Jost Bade is 30 years old and was born and raised up near Paderborn. He holds a B.A. in Business Administration and after completing a dual course of studies at FHDW in Paderborn he started his career at PHOENIX CONTACT in Bad Pyrmont in the HR Department. He is in charge of parts of different plants from PHOENIX CONTACT e.g. in Berlin, Paderborn and Bad Pyrmont. 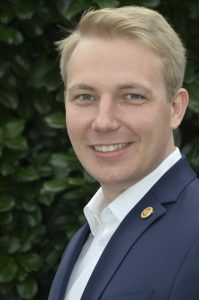 At the age of 18 Jost became a member of Rotaract Club Paderborn where he served in all functions of a Rotaract Club from secretary up to president. During his membership he organized several national and international Rotaract events e.g. DeuKo2010 (German Rotaract Conference) and EuCo2011 (European Rotaract Conference). In his leisure time he loves playing golf and spending time with his family and friends.